This is a photo that I took a few weeks ago (February 2nd, to be exact), but I hadn't had a chance to do anything with it. Tonight I came across the photo again and decided to post it. This is a photo of a spot I pass quite often, almost daily, but this time, I stopped in my tracks! 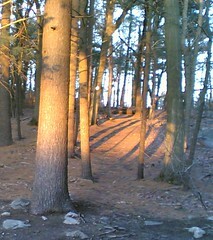 The light was beautiful, and I loved the shadows cast by the trees. Although I was in a hurry (as usual), I took a quick picture with my phonecam. Tonight I finally got around to editing the image, and it didn't need much, just basic rotating, cropping, and tweaking the contrast just a bit. This photo is really the result of a quick decision to stop rushing for a second, and just look.